Under the Fair Labor Standards Act (FLSA) an employer is permitted to take a tip credit toward its minimum wage obligations for tipped employees equal to the difference between the required cash wage (at least $2.13 per hour) and the federal minimum wage (currently $7.25 per hour). 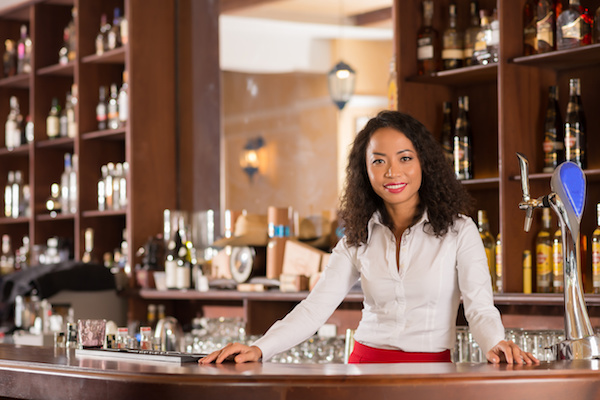 A tipped employee is one who is in an occupation that customarily and regularly receives more than $30 per month in tips (ex: bartenders, wait staff, valets, etc.). However, there are some restrictions placed on employers who take the tip credit. One restriction is that employees paid on a tip credit basis may only be required to participate in a tip pooling arrangement with other customarily tipped employees. Therefore, employers who take a tip credit could not have a tip pooling arrangement in which non-tipped employees (i.e. back-of-house employees) share in the tips received. The FLSA is, however, silent on whether this restriction applies to employers who pay their tipped employees at or above the federal minimum wage. This has resulted in some confusion and conflicting litigation. The Ninth Circuit Court of Appeals took on this question in 2010. The Court ruled in Cumbie v. Woody Woo, Inc. that the tip pooling restrictions did not apply to employers who paid tipped employees at or above the federal minimum wage. Therefore, such employers could implement a tip pooling arrangement which included employees who did not customarily receive tips. In this case, Misty Cumbie worked as a waitress at a restaurant in Portland, Oregon owned and operated by Woody Woo. Woody Woo paid its servers a cash wage at or exceeding Oregon’s minimum wage, which exceeded the federal minimum wage (which at that time was $5.85 per hour). In addition to their daily wage, server received a portion of their daily tips. Woo required its servers to contribute their tips to a tip pool, which redistributed the tips to all restaurant employees. The largest portion of tips (55% – 70%) went to kitchen staff with the remainder (30% – 45%) returned to the servers in proportion to their hours worked. In response to the Cumbie v. Woody Woo, Inc. decision, the Department of Labor (DOL) issued a regulation prohibiting employers from retaining any tips earned by employees, regardless of whether the employer took a tip credit against the federal minimum wage or not. The regulation established that tips were the sole property of the tipped employee and could not be shared with non-tipped employees. All tip pooling arrangements under this new regulation were a violation of the FLSA. Not surprisingly, the DOL’s regulation lead to more litigation regarding tip pooling, particularly in the hospitality industry. In February 2016, under different circumstances, the Ninth Circuit Court of Appeals ruled that employers were prohibited from utilizing tip pools that included non-tipped employees. In Oregon Restaurant and Lodging Association v. Perez, the Court found that the DOL has the authority to prohibit all tip pooling arrangements as the FLSA is silent on defining tip pools. Therefore, employers within the Ninth Circuit, which includes Nevada, who are paying at or above minimum wage to tipped employees are prohibited from utilizing tip pools that included non-tipped employees. This case involved multiple employers, but all had the same tip pooling arrangement. The employers did not take a tip credit against their minimum wage obligations; all tipped employees were paid at least the federal minimum wage. However, the employers required their employees — tipped and non-tipped employees — to participate in tip pools. Earlier this year, the Tenth Circuit Court of Appeals, which includes Colorado, Kansas, New Mexico, Oklahoma, Utah, and Wyoming, rejected the 2011 regulation finding no ambiguity in the in the FLSA regarding tip pooling. The Court in Marlow v. The New Food Guy, Inc. found that employers who pay at least minimum wage do not violate the FLSA by retaining tips or redistributing tips among other employees, including employees who do not customarily receive tips. Bridgette Marlow worked for The New Food Guy and was paid $12 per hour ($18 per hour when she worked overtime), which is well above the federal minimum wage. The New Food Guy accepted tips from customers following catering events, but did not supplement the hourly wage of its workers with any share of the tips received. We have two conflicting decisions at the appellate level. What do we do? The National Restaurant Association, among others, is petitioning the United States Supreme Court to hear an appeal of the Ninth Circuit decision to have a final determination regarding the applicability of the 2011 regulation once and for all. However, the DOL has recently proposed to rescind the restrictions on tip pooling. If the DOL follows through on their proposal, a tipped employee who is paid at least minimum wage could be required to share any tips received with other employees — tipped and non-tipped — as designated in his/her employer’s tip pooling arrangement. However, the restriction would continue to apply to employers who take a tip credit for tipped employees. Until the DOL issues a final rule on this issue, employers should continue to follow the restrictions currently in place.